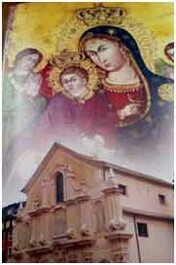 The Secular Benedictine Oblate is "the Christian, man or woman, layman or cleric who, living in his family and social environment, recognizes and accepts the gift of God and his call to serve him, according to the potentials and requirements of baptismal consecration and of one's state; he offers himself to God through oblation, inspiring his own journey of faith to the values of the Holy Rule and of the monastic spiritual Tradition "
From the time of Saint Benedict until today, the Benedictine Rule is the guide of the oblate, the constant point of reference from the moment in which he is spiritually linked to a Benedictine monastic community. 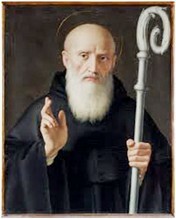 It is within it that the Oblate makes the journey of constant search for the will of God, which he discovers in the infinite ways in which he reveals himself: from the sacred text, to nature, to everyday events, to work tools, to the monks and Oblates given to him as brothers and sisters, and to all the people he is meeting. Like St.Benedict, confused by imperial Rome in decline, he decided to change his life, without being aware that doing so he would have helped to change the world, so we invite you to reflect on this extraordinary equation: the world will change if we change! The oblates are bound to their monastery and share in the prayers. Make a spiritual path in a way that is appropriate to their personal situation and circumstances where they were placed by Providence, in union with the whole Church. The offering that is well understood and lived, instead of being a hindrance, is a support and an incentive to better fulfill the duties of their state, and to ensure greater grace. 4. The saints who have already come to God's presence maintain bonds of love and communion with us. The book of the Apocalypse attests it when it speaks of the martyrs who interced: "I saw under the altar the souls of those who were sacrificed because of the word of God and of the testimony that had made him. And they cried out with a loud voice: "Until when, Sovereign, you who are holy and true, will you not do justice?" »(6: 9-10). We can say that "we are surrounded, led and guided by the friends of God. [...] I do not have to carry alone what I could never carry alone. The host of the saints of God protects me, supports me and carry me ». 6. We do not think only of those already beatified or canonized. The Holy Spirit pours holiness everywhere into the holy faithful people of God, because "God wanted to sanctify and save men not individually and without any connection between them, but he wanted to make them a people, to recognize him according to the truth and to serve him in holiness. ». The Lord has saved a people in the history of salvation. There is no full identity without belonging to a people. So no one saves alone, as an isolated individual, but God attracts us taking into account the complex web of interpersonal relationships that are established in the human community: God wanted to enter a popular dynamic, in the dynamics of a people. 7. I like to see holiness in God's patient people: in parents who grow their children so lovingly, in men and women who work to bring bread home, in the sick, in the elderly religious who keep smiling. In this constancy to go forward day after day I see the holiness of the militant Church. This is so often the holiness "of the next door", of those who live near us and are a reflection of the presence of God, or, to use another expression, "the middle class of holiness". Holiness is the most beautiful face of the Church!